This study remained in the artist's studio for a long time, and was sold fairly late, probably in the 1920s. It was signed and dated by the artist at that time, and wrongly carries the date of 1883, a detail contradicted both by the archives and by its stylistic qualities. Brightly coloured, this painting is representative of the works of the young Signac, an "Impressionist" painter and great admirer of Monet's. In 1882, this young man of 17, with a great passion for the sea and sailing, had chosen to spend his first summer as a painter in the small Norman port of Port-en-Bessin. He had gone back there the following year, and again in the summer of 1884, where he executed for the third time a series of paintings dedicated to the various aspects of this modest fishing port. This picture belongs to the third and last series dedicated to Port-en-Bessin. Two works on the same subject painted the previous year were used to prepare this picture (FC 21 and 25).1 But here we see for the first time, on the bright new quay, the vermilion arches of the fish market. 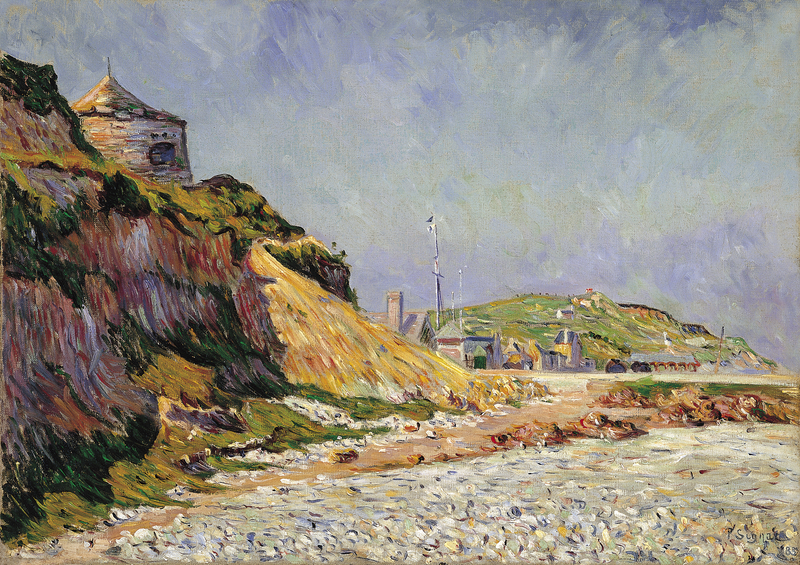 In 1884 Signac was still under the influence of Guillaumin, Caillebotte and particularly of Monet. In fact, an exhibition of works of the latter, organised in the premises of La Vie moderne in 1880, was crucial for the young artist's career. And his admiration for Monet had been rekindled a few months before, in March 1883, on the occasion of the exhibition in the boulevard de la Madeleine of the works painted in Varangeville by the father of Impressionism. During that summer of 1883, when Signac was not yet twenty, he was already proving to be a very respectable Impressionist painter. If the sea views executed in Port-en-Bessin still expressed his admiration for those great masters, they also bore witness to those qualities which were soon to be disciplined by the neo-Impressionist method and would determine his future work. Here, the colourful enthusiasm and strength of his brushstroke are already channelled by the rigorous organisation of the composition. In the foreground, the sharp opposition of areas of shade and light already expreses his taste for contrast. And the marked orthogonal lines-the quay, the old tower, the masts-foretell his predilection for front views would will characterise his future works. As to his brushstroke, long and brightly coloured to depict the embankment in the foreground, curved and forceful to express the strength of the waves and the surf, it conveys all the energy and enthusiasm of the young painter. A few months earlier, Signac had become friends with Seurat during the creation of the first Salon des Indépendants, but the influence of the latter is not yet felt in the series of works painted in Port-en-Bessin. In 1888, probably following Signac's suggestions, Seurat travelled to the small Norman port where he painted a wonderful series of sea views, in his case in the strictly neo-Impressionist style.